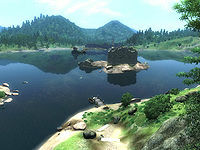 In 3E 433 a floating island appeared in the bay, on which a door to the Shivering Isles was opened by Sheogorath in his search for a champion. From the east side of the bay going south and around, Fort Aurus, Fort Irony, the Ayleid ruin Bawn, Flooded Mine, a Wayshrine of Zenithar, and Veyond Cave all border the bay. Fort Grief Island sits near the mouth of the Silverfish River, while the underwater section of Fathis Aren's Tower can be found far south of the fort. A Door in Niben Bay: Cross the threshold but maintain your sanity. Esta página foi modificada pela última vez à(s) 22h30min de 9 de fevereiro de 2015.